Looking for the best mattress covers and encasements for your bed? What features should you look for in a mattress cover? How do mattress covers and encasements work? Are covers and encasements effective at keeping bed bugs out? What about covers for couches? Click here to skip to our top pick! When it comes bed bugs and mattress covers, you're going to need something that protects AND doesn't feel miserable or heat up your bed like an oven. With that, our top picks goes to the SureGuard Encasement. Its top layer is made with 100% cotton, which is one of the most breathable fabrics right along side linen. Most other covers are made with a synthetic polyester blend that feels like plastic, crinkles, and heats up very quickly. Also, despite what you may have heard, bed bugs can't bite through fabric. As long as your cover completely encloses your mattress and bed spring, your bed is safe. This cover could be a bit more water resistant, but since this is a product review on bed bug covers, we liked the SureGuard. If you want something a bit more waterproof, we'd recommend the Red Nomad, which is a bamboo/polyester blend and a close 2nd in our analysis. Continue reading for our full breakdown and more information on bed bugs and mattress encasements! What Should You Look For In a Mattress Cover? How Do Bed Bug Mattress Protectors & Encasements Work? Do bed bug mattress covers and protectors work? Are There Bed Bug Covers and Encasements for Couches? Check out our below list for a summary of our results. Keep on reading to learn more encasements and bed bugs! You've just purchased a $3,000 king bed after months of research and deliberation. You're excited... happy... and comfortable yes! Two months later after coming home from a trip, you've noticed bed bugs. Say good bye to that $3,000 bucks, this mattress needs to go in the garbage. But what if you could have SAVED that mattress and protected your mattress from bed bugs in the first place. Well, you can, with a bed bug mattress cover or protector. These are fabric encasements that enclose the entire contents of your bed protecting them from bed bugs but keeping things comfortable for you. According to Jonathan Prichard, CEO of MattressInsider.com, no matter how good your mattress is, once infested, getting rid of these pesky critters is a battle you should not underestimate. These are a must for anyone who cares about their bed. In this guide, we'll breakdown how to buy the best bed bug encasement cover and which products are the top on the market. 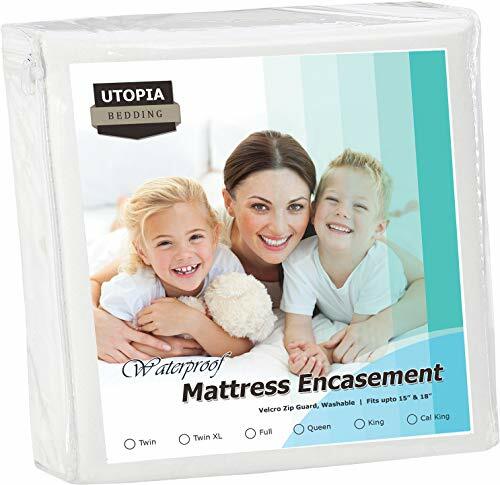 The best mattress covers will completely envelop your mattress and box spring, with a zipper that will not allow further bed bugs from penetrating your furniture. It's important that the stitching on the mattress cover is reinforced to withstand wear and tear since you will be suffocating the bed bugs for an extended period. A hole or even a scratch on the mattress cover can compromise its ability to contain the bugs. The zipper is a standard feature in most bed bug mattress covers, and unfortunately is also one of its potential weak points. If the zipper has large teeth with gaps between them, then the 3/16" bed bugs can easily weave through it and escape. Your bed bug mattress cover needs have tiny teeth that are tight. Reinforcement is the next factor you need to consider when purchasing a mattress cover. The bed cover needs to stay on, with the edges of the cover using stronger padding. This will ensure that the cover drapes around your mattress and that the edges of the mattress cover do not rip over time. If you're the type of person who's easily affected by dust or pollen, then getting a hypoallergenic cover is important. Don't forget to check! While you're at it, make sure it's waterproof as well. Given the nature of the bed, there's a good chance you'll sweat or accumulate some other type of moisture on it. We've seen waterproof covers protect a bed bug baby urine, spills, and other types of mistakes outside of normal bed bug protection. Some manufacturers have a lackluster 1 year warranty, which doesn't give us too much comfort that it's worth your money. The more trusted companies provide 5-10 year warranties. Keep an eye out for the warranties when deciding what to buy! Applying a mattress protector to your bed is extremely simple and will protect bed bugs from getting inside your mattress as well as trap bed bugs inside (staving them to death). Most come with a envelop compartment to slide your mattress or encasement inside. The key is to get someone to help lift the bed with your. This alone will make this process 100x easier. Take a look at the below video for a demonstration. Bed bugs find you by the CO2 that is emitted when you exhale, using your body as a sort of guide to find its host. Even though they may look like fleas, bed bugs cannot jump, which means that to get to you, they will have to climb. A bed bug encasement or mattress cover may not be particularly useful in thwarting off an incoming bed bug, but it can be effective to help prevent current populations from flourishing in your household. A mattress encasement can also protect your bed from insecticides and other treatments used to control the bed bug infestation. When a bed bug mattress encasement is used in conjunction with bed bug trap and interceptors, then it can help stave off and reduce the chances of the bed bug finding you. Traps and interceptors work by creating a dead fall around the legs of your bed. When a bed bug starts to climb over the edge of the interceptor, it'll fall and slip under the slippery surface of the trapper. It won't be able to crawl out. Adhesive-based traps can be used in conjunction with additional forms of pest control to help capture any wandering bed bugs when you aren't sleeping in your bed. Yes – brands like Everest Supply and SofaSafe specialize in couch encasements, which can be particularly effective if you have a bed bug problem in the family area. Even though most people think the bed bugs pay attention only to bed-ridden hosts – and they mostly do – bed bugs can also be an irritating presence on your furniture and anywhere where there is a concentration of people. If you want to protect your bed, the covers and encasements below should help. If you already have bed bugs, our recommendation would be get a professional consult to get a handle on the level of your infestation. 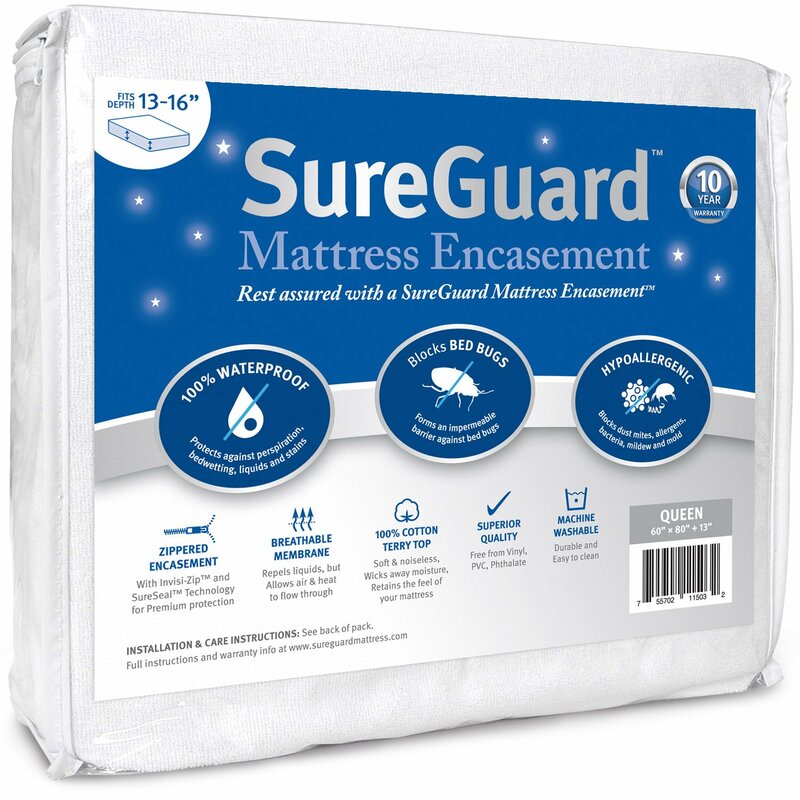 100 percent waterproof and hypoallergenic, the SureGuard mattress encasement completely envelops your bed. It caters to all bed sizes, from twin to California King. As mentioned, the most important feature of any bed bug encasement or cover is its zipper. Its super fine zipper uses "SureSeal" technology – in other words, it completely seals off the mattress from the outside, suffocating and starving the bed bugs. It is also hypoallergenic and machine washable. That means that not only will your encasement entrap the bed bugs, but it will not agitate dust, waste, or bacteria and make them airborne. 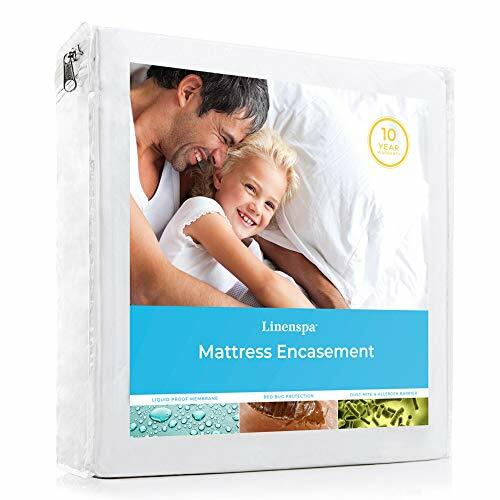 Even though it is heralded as one of the best mattress covers, it is also one of the thinnest and softest covers as well, with a noiseless material made from 100 percent cotton. Not only does it have a zippered panel, but it also uses a series of Velcro zip guards to keep the current bed bugs in, and creeping bed bugs out. Knitted polyester fabric is lightweight, whisking away moisture. It offers a perfect combination of comfort, while actively protecting you and your family from bed bugs. Its impervious surface is made to be bite proof, qualities that you want to look for in a premium bed bug mattress cover. When laundering this mattress cover post-infestation, you will be able to hand wash it or use a mild detergent in the washing machine. You can then use this cover as a regular bed cover to protect your investment. The thin waterproof barrier protects your bed from all sides, with a vinyl free material that is safe to use around your family. It can fit almost any mattress that is up to 12" deep, with the cover fully encasing it with a lightweight fabric. The zipper is reinforced with a fabric rib to ensure that any bed bugs, liquids, and allergens do not leave or enter the bed. One of the annoying features of many mattress covers is that it produces a crinkly noise when you sit or lay on it. The Linenspa mattress protector is soft, feeling like a regular blanket. One of the byproducts of bed bugs is that they release waste that can easily be part of your home's dust. Here's the inconvenient truth - dust bunnies and dust particles are going to be a normal occurrence in any home, regardless of how clean it is. However, there is a particularly gross aspect of knowing that the dust is also mixed with the feces of the bed bugs. The mattress cover is hypoallergenic, with closely woven fabric reducing airborne bed bug waste. 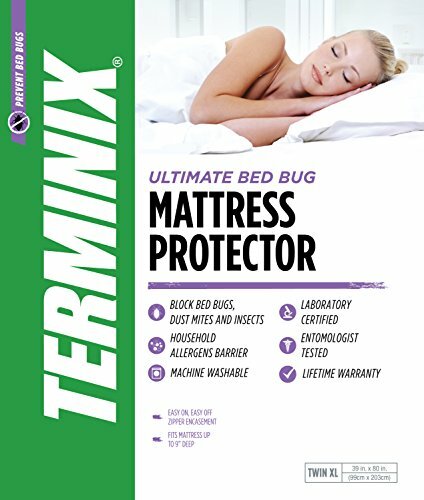 Terminix is a world-renowned pest control company that offers professional grade products to everyday consumers – and they didn't disappoint with their line of mattress covers that fits queen-size beds and even California Kings. Their Terminix mattress protectors are premium, six-sided covers that provide lasting protection. Not only is it celebrated by many homeowners as a solution to bugs, but it has been certified via entomologist tests, with a lifetime warranty backing up the Terminix mattress protector. Overall, the Terminix cover is pretty good, but we didn't find anything truly remarkable about their specific encasements. It looked to be a fairly standard product, but leaned heavily on their brand to push sales. Red Nomad offers comprehensive, versatile protection. Its medical grade cover fully envelops your bed with a waterproof casing to reduce any allergens and prevent any bed bugs finding refuge in your home. Red Nomad is a celebrated brand that utilizes a patented breathable design that won't increase body temperatures. Inferior mattress covers tend to be crinkly, make noise, and feel hot after a while. 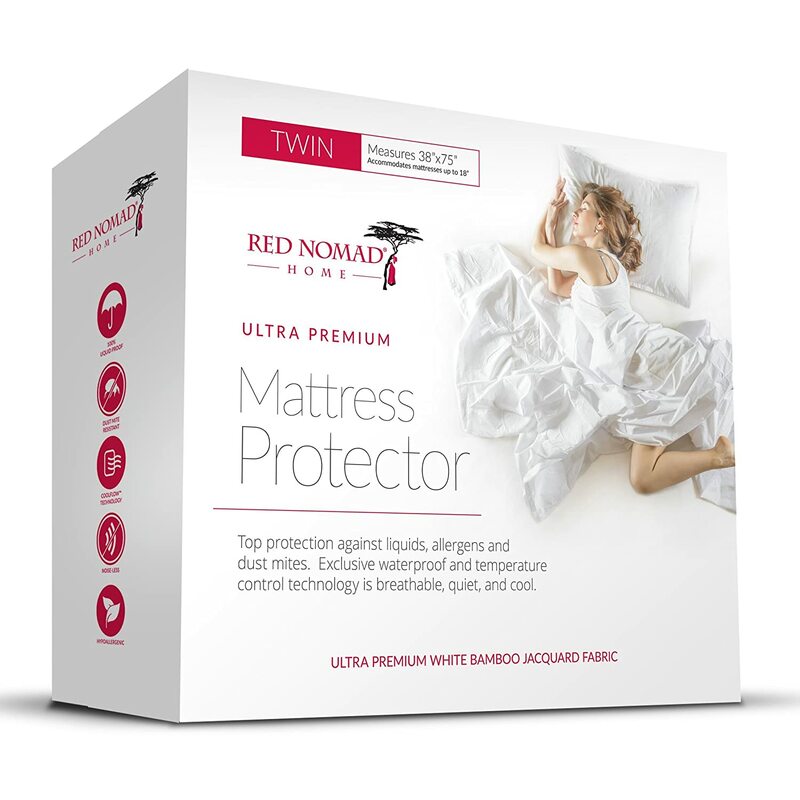 Red Nomad uses soft polyester knits, with no crinkling potentially compromising its ability to filter out any contaminants coming from the bed bugs. 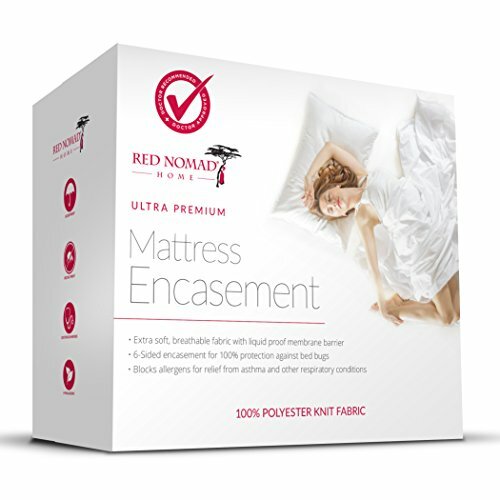 The Red Nomad Encasement is compatible with certain TempurPedic models. The placement of the zipper may not make it the easiest cover to install, but once on, it will protect your mattress from spills, allergens, and annoying bed bugs. Although we like the Red Nomad, our top picks goes to SureGuard due to its cotton fabric material (the softest we could find) and 10 year warranty. 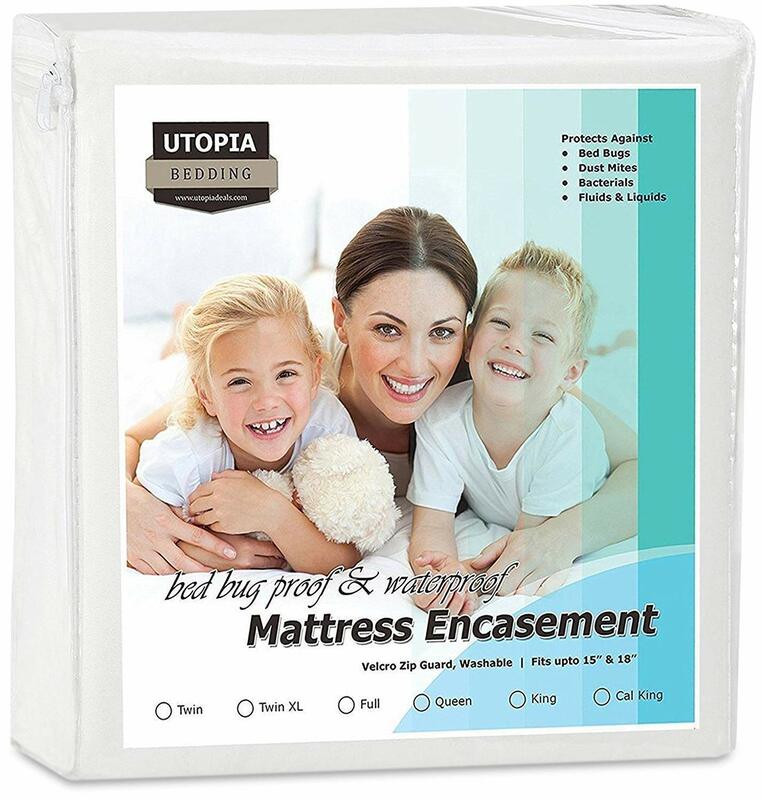 Bed bug mattress covers and encasements are the ideal solution for those who do not want to use caustic chemicals in their homes. When used in conjunction with other forms of pest control, bed bug encasements can be an economical way to not only protect your bed, but also make sure that any living bed bugs does not have access to a host anymore. Our Queen size mattress is 1 foot thick & has no box springs . It sits in a wooden frame. We have not seen signs of the bedbugs, except when they are biting us at night. Even tho’ we have flipped it up during bombing, we saw none of the characteristics of their presence. Will the Sure Guard cover it? The cool thing about encasements is that they stop bed bugs from getting in OR out. If you haven’t seen any bed bugs on your mattress, I would cover it up. Possibly even consider renting a bed bug heater to ensure anything on it is dead. Once covered, you should be good to go. Just make sure to check if the Sure Guard type you pick is big enough for your mattress.